Solkor Can Create Everything from a Small Backyard Patio to a Complete 360° Landscape Around Your Entire Home. No project is too small or too big for Solkor. We are happy to provide a range of landscape construction services that can help you brighten up an existing space, redesign a dated yard, or create the outdoor living area you've always desired. Add curb appeal with a well-designed driveway or walkway that blends into the landscape, or create a welcoming outdoor retreat with a sohpisticated backyard patio. 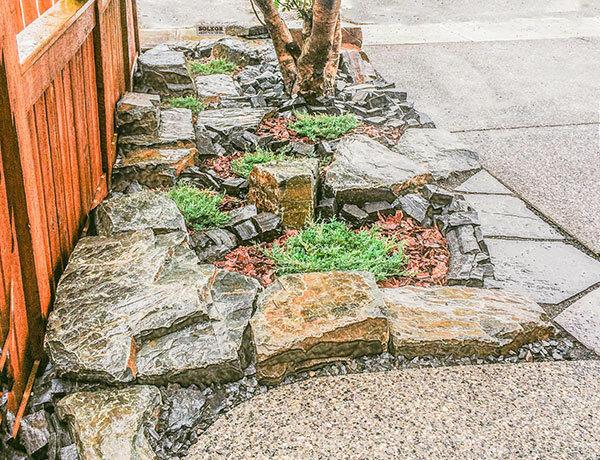 Turn the grade changes on your property into beautifully-landscaped features with Solkor's creative retaining walls constructed of a variety of materials, including wood, stone or concrete. We'll create the perfect water feature to complement your existing space, or we can design something that will become the focal point of a whole new landscape. 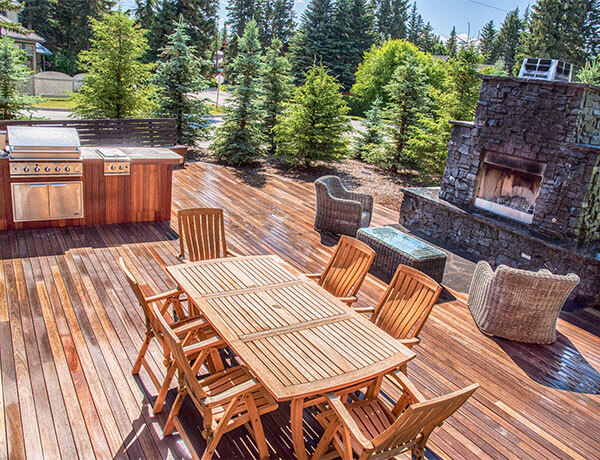 You'll want to cook all your meals outside when you have a Solkor-designed outdoor kitchen – regardless of the Bow Valley's chilly, snowy winters. 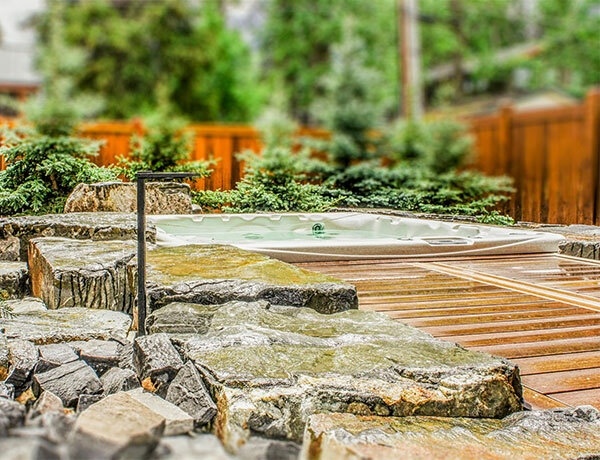 Sink into luxury and surround yourself with the gorgeous mountain scenery in a regular or sunken hot tub. 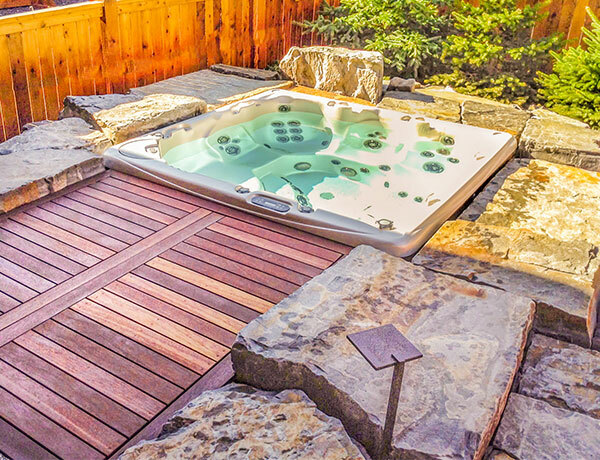 Whether it blends into your deck or is surrounded by custom stone work, your hot tub will become an eye-catching feature. Custom design meets quality construction. Solkor's decking and fencing solutions blend seamlessly with the mountain landscape, and our pergolas enhance any sitting area or garden space. Extend your outdoor entertaining season with a Solkor-designed gazebo or enclosure. These structures provide a perfect transition from the comfort or your home to the beauty of the outdoor landscape. Whether you're entertaining guests or want to spend time alone, you'll be drawn towards your fully-custom fire feature that adds intimacy and warmth to your outdoor spaces. Let us handle the dirty work necessary to turn your front lawn or backyard into the landscape of your dreams. with experienced workers and high-quality equipment, we do the job safely and efficiently. Proper drainage solutions and erosion prevention is a key part of any landscape we build. After all, we build our landscapes to last. We want yours to stand the test of time, too. Forget unattractive and obtrusive concrete retaining walls. Inspired by the Rocky Mountain landscape around us, Solkor can create beautiful concrete and stonework including seating, walkways, canyons, flagstones and garden features. Our low-maintenance irrigation systems help keep your yard looking healthy and vibrant without having to haul hoses or set up sprinklers. Custom lighting adds warmth and style to walkways and seating areas.